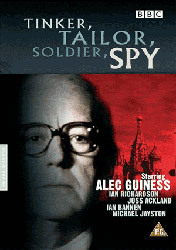 Tinker, Tailor, Soldier, Spy is one of the most complex and rewarding miniseries with a sophisticated plot of intrigue and spies. Not the kind of movie spies that are constantly in shoot ups, but more realistic spies who are sneaky and duplicitous, who double cross and triple cross and are smart enough to get away with it. If you only know him as Obi Wan Kenobi get ready to love Alec Guinness all over again as he shines as the great character of George Smiley, a former agent who has been given a daunting task. One of four top men in the circus (the British nickname for the secret service) is a mole, but Smiley must find out who it is as an outsider, with none of the perks of his former position. Watch for a sinister Patrick Stewart as Karlof, an evil Russian, and my favorite gentleman actor, Ian Richardson is beyond amazing as one of the suspected traitors. There were several times while watching this that we had to press pause and get everything straight. This series, which is based on a novel by John LeCarre does not pander to its audience, it's quite challenging. In other words don't watch when you are very tired.